How To Use Singing Bowls: Charge It Up! Joska Soos, the Hungarian shaman I visited in Belgium, once told me that the singing bowls he was selling (he got them from Tibetan lamas) were once filled with the bones of high ranking lamas. In Tibet it was tradition to keep the bones of a dead lama, especially when he had been highly spiritually evolved, to transfer this spiritual energy unto ritual objects, or to make ritual objects out of the bones themselves, like malas (string of beads) and bone trumpets. You might not have such a specially charged singing bowl, but the bowl you do have you can use to charge up objects. Sound is a powerful force, the different metals have also an effect, and the tones definitely create positive vibrations. Most important is the intention you put into it. Sound is a carrier for energies and can thus be used to transfer your energy, a thought form, an emotion, a wish or any other special energy. When putting an object into the bowl, put a small pad under the object to prevent rattling. Since the base of the bowl is a nodal (still) point placing an object there does not interfere with the sound. 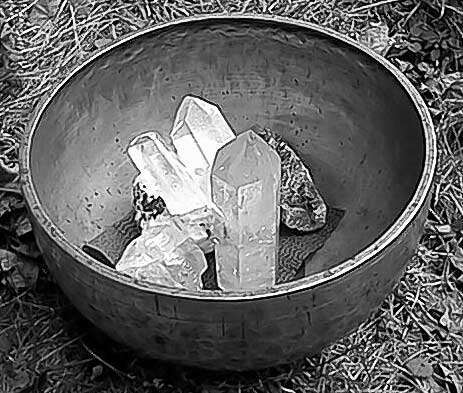 Crystals respond very well as they are piezo-electric, they create electric current when pressure is applied, and sound waves are pressure waves. I sometimes put a picture of a person in a bowl to send him/her healing energy. You could also write a wish on a piece of paper and put it in there to make you wish come true. Of course, always make sure you really know what you are wishing for. You always receive what you send out, including any negativity. It is easy to charge up water. Just put some water in the bowl. Do not fill the bowl all the way, as water dampens the sound. The more you fill a bowl with water the more the sound will change. I do not recommend drinking the water, but you could use it to water your plants. You can put the whole glass of water, glass and all, in the bowl if you want to drink it. Just put an adequate pad underneath so it does not rattle. A piece of felt is good. Look and you will see the waves of sound making patterns in the water. You can play to your plants, and playing your bowl in the garden is a nice thing to do.